“Zayden” has to be made up. Aren't all names made up, though? Probably shouldn't pick your kids' names while playing Scrabble tho. Why not? qkmozxic sound like a great name to me! If I get you to say it backwards, it will teleport you to the fifth dimension. I'm 31 and I don't know what half of these names are even supposed to mean. What the hell is Ximena? I look forward to the 2028 edition, which will no doubt include Bazinga, Toriel, Despacito, Szechuan, Retsuko, Cuphead, something with a hashtag in it, and Yanny. I mean Laurel. I mean Yanny. No wait, Laurel. No, I'm pretty sure it's Yanny. This car is parked around the corner from me and I'm curious what I'm seeing? Since I'm publicly displaying someone's vehicle and license plate I figure it's better to do it here with limited viewers instead of on Facebook when more would see it. 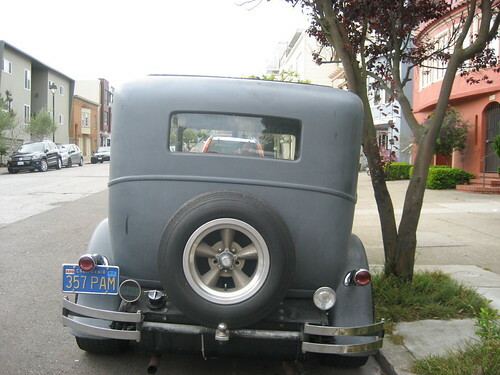 Manufacturer, model, year? Even with my limited knowledge of cars I can tell those are newer style tires. I'm curious about other things that look like modern add-ons compared to possibly original pieces. If it gets to a point when a closer look is needed at some key identifying feature then let me know and I can do a crop to enlarge something. There's appears to be a possibly a badge of some kind above the radiator; that could be useless or it could be helpful. 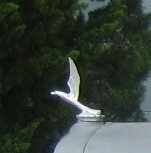 or one of the several sites for hood ornament collectors. Thank you for the guess and research. If I happen to catch the owner getting in or out of the car then I can ask about it. 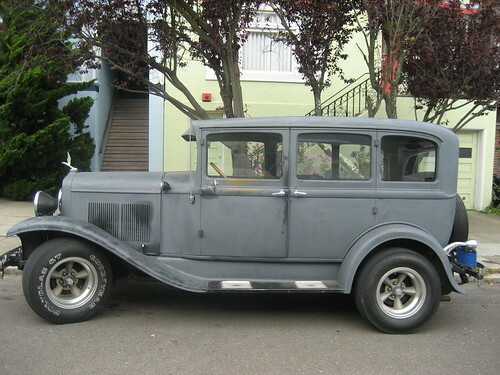 1929 Pontiac four door sedan. Well, maybe not a 29...the engine vents still don't line up, but it's in that vicinity. 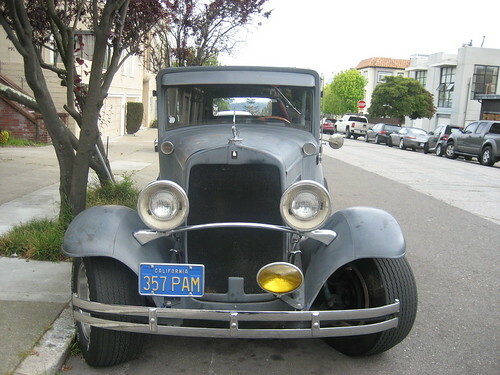 According to this post on the San Francisco Citizen blog it is a 1930 Plymouth Model 30U. 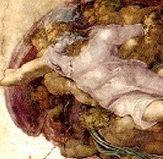 Wow, amazing work. Okay case closed. Thank you so much. 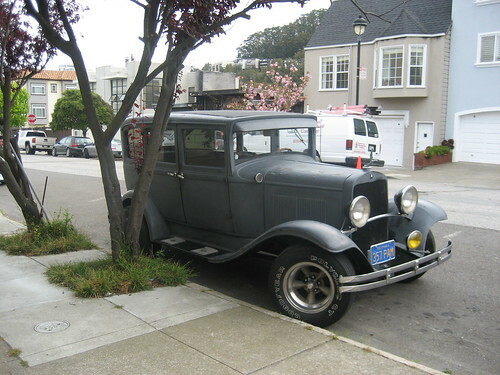 I love the style of that car! It reminds me of some recent "box" cars such as the Kia Soul, Nissan Cube, and Toyota Scion. I guess it's true that everything old is new again. Yeah, but the older car is a good-looking car. The recent ones are monstrosities. Oh my goodness no! I had one of those (I think a Cube) as a rental in Kansas a few years ago. It was very windy, and that thing got thrown all over the road. Definitely a lot more than a 'regular' car would have. Right, that. Thank God I’ll never have to see any of these guys again after Monday. The Georgia ads called my two AL ads and raised me one. It's nice to have this thread to share things that don't belong anywhere else on this board. I can’t believe Nancy Pelosi doesn’t wave a gun in her ads. Those ads are pretty typical here. Let everyone know how religious you are or how you love guns. Not sure how that qualifies you to run the state. I voted absentee yesterday. Neither one of them got my vote. But I think she probably wins the nomination. On a side note, she publicly endorsed Roy Moore even though she believed he dated underage girls. But the guy I went for (mayor of Huntsville) also supported Moore. I have no idea if the other guy wins lieutenant governor. He’ll probably be in a runoff against some career party hack. I voted for the third person on the ballot, even though I’d never heard of him. But the LG race is just to see who’ll be the front runner for the big chair in 2022. In my local state Senate race, the high and mighty on my community Facebook page have spent the last week whining about the incumbent, including one person posting some secret information someone gave her. I really didn’t care about the race (one Republican against another in a red dominated state) but I went with the incumbent just to annoy them. Well, every Republican primary in my state has devolved into who can be the most virulently anti-immigrant candidate in the field, so if I choose to vote in the primary on Tuesday, I’ll be making a choice between two middle-aged women named Stacey running on education. Given all the diabeetus jokes I make, I found this video funny. I can't figure out which song "Country Buffet" is a takeoff of, though.